Imagine two people who have seemingly equal skills and background. They go to work for two different companies. However, one "superstar" company grows much faster, so that wages and opportunities in that company also grow much faster. Or they go to work in two different cities. One "superstar" urban economy grows much faster, so that wages and opportunities in that city also grow faster. The McKinsey Global Institute has a nice report summarizing past evidence and offering new evidence of their own in Superstars: The Dynamics of Firms, Sectors, and Cities Leading the Global Economy (October 2018). It's written by a team led by James Manyika, Sree Ramaswamy, Jacques Bughin, Jonathan Woetzel, Michael Birshan, and Zubin Nagpal. Short summary: Superstar firms and cities do seem to be widening their economic leadership gap, with the evidence that certain sectors are superstars seems weaker. "For firms, we analyze nearly 6,000 of the world’s largest public and private firms, each with annual revenues greater than $1 billion, that together make up 65 percent of global corporate pretax earnings. In this group, economic profit is distributed along a power curve, with the top 10 percent of firms capturing 80 percent of economic profit among companies with annual revenues greater than $1 billion. We label companies in this top 10 percent as superstar firms. 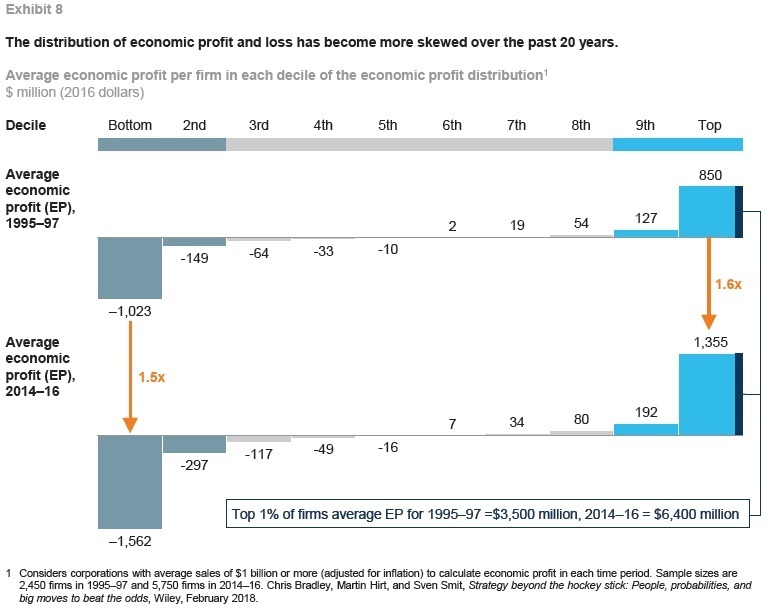 The middle 80 percent of firms record near-zero economic profit in aggregate, while the bottom 10 percent destroys as much value as the top 10 percent creates. The top 1 percent by economic profit, the highest economic-value-creating firms in our sample, account for 36 percent of all economic profit for companies with annual revenues greater than $1 billion. Over the past 20 years, the gap has widened between superstar firms and median firms, and also between the bottom 10 percent and median firms. ... 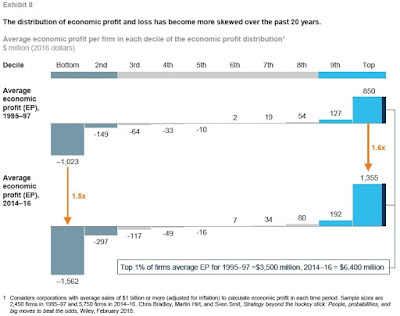 The growth of economic profit at the top end of the distribution is thus mirrored at the bottom end by growing and increasingly persistent economic losses ..."
Here's an illustrative figure, showing firms by decile, and comparing the time windows from 1995-97 and from 2014-2016. Some other patterns are that the superstar firms "come from all sectors and regions and include global banks and manufacturing companies, long-standing Western consumer brands, and fast-growing US and Chinese tech firms. The sector and geographic diversity of firms in the top 10 percent and the top 1 percent by economic profit is greater today than 20 years ago." Along with being more profitable, superstar firms spend more on R&D and on intangible investments like intellectual property, software, and brand value. In additinon, the rate of movement (or the "churn") in and out of the deciles doesn't seem to have changed much over time. "In the top 1 percent by economic profit, only one out of every six of today’s superstar firms has been there for the past three decades. They are mostly American and European consumer goods and technology firms that have survived, often through reinvention and adaptation to a changing environment and sustained investment, and they own some of the world’s most familiar brands.26 They include Altria, Coca-Cola, Intel, Johnson & Johnson, Merck, Microsoft, Nestle, and Novartis. They are joined by several other firms that have stayed in the top ranks for two-thirds or more of the past 30 years and that come from a broader set of regions and sectors. These include firms such as Samsung, Toyota, and Walmart, and they make up another one-sixth of the top 1 percent." 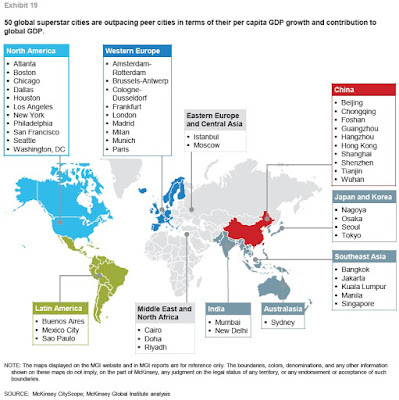 The analysis also identifies 50 superstar cities, with a map below. "Fifty cities are superstars by our definition ... The 50 cities account for 8 percent of global population, 21 percent of world GDP, 37 percent of urban high-income households, and 45 percent of headquarters of firms with more than $1 billion in annual revenue. The average GDP per capita in these cities is 45 percent higher than that of peers in the same region and income group, and the gap has grown over the past decade. ... The growth of superstar cities is fueled by gains in labor income and wealth from real estate and investor income, yet many show higher rates of income inequality within the cities than peers. ... Of the 50 superstar cities, 31 are ranked among the most globally integrated cities, 27 among the world’s 50 most innovative cities, 26 among the world’s top 50 financial centers, and 23 among the world’s 50 “digitally smartest” cities. Twenty-two are national and regional capitals, while 22 are among the world’s largest container ports." For individuals thinking about potential employers, and for individuals and firms thinking about location decisions, it's useful to consider the potential gains of being connected to a superstar firm or city. For a national economy, a different question arises. What is the "special sauce" that superstar companies and cities are using to achieve their outsized and growing levels of productivity and income? Companies and cities will always differ, or course. But the rising advantage of superstars raises a question of how at least some of those practices and policies might be more broadly disseminated across the rest of the economy.